ACHIA supports practices interested in improving patient outcomes by running evidence-based learning collaboratives. Every collaborative strengthens practice continuous quality improvement (CQI) skills and is organized around topics such as obesity treatment and prevention, screening for developmental delay, autism, and social emotional issues, and preventing HPV related cancers. Each project operates with the premise that solutions to improving care are already in place in the community. The collaborative gives structure and a platform for practices to share best ideas with colleagues across the state. Satisfying meaningful federal requirements for value-based reimbursement. Strengthening ties to Alabama resources such as Help Me Grow Alabama and to Alabama Experts such as the Directors of the weight management clinics from the University of Alabama at Birmingham and the University of South Alabama. Collaboratives last six to twelve months. Each practice has a core team that typically is comprised of a lead physician, administrative lead and clinical lead. Many collaboratives are conducted virtually with monthly webinar meetings for the core team. Some collaboratives have a CQI consultant visit to kick off the project. The core team is responsible for engaging the remaining practice members in change ideas based on collected data. How will we know if a change is an improvement? 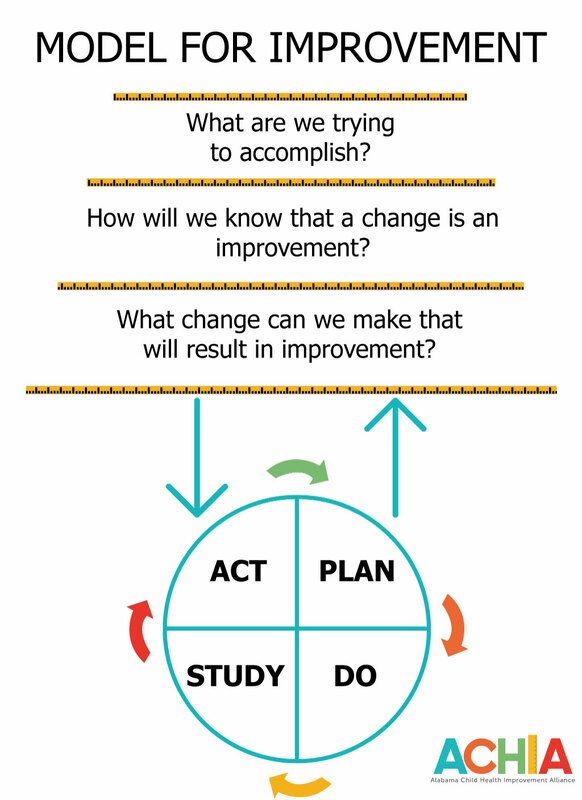 The most widely applied QI tool is the Plan-Do-Study-Act tool, which allows practices to make small tests of change before implementing change practice-wide. ACHIA grew out of Asthma Quality Improvement Collaboratives brought to our state by the Alabama Chapter of the American Academy of Pediatrics (AL-AAP) in 2009. After several cycles of asthma collaboratives, the AL-AAP realized the power of practice transformation but also that for CQI work to be sustained, more partners need to be engaged. In the summer of 2013, Children’s of Alabama hosted a group of interested stake holders brought together by the AL-AAP to learn more about the impact of Improvement Partnerships that were being established across the country. Judy Shaw, EdD, MPH, RN, FAAP and Chuck Norlin, MD from the National Improvement Partnership Network were guest speakers. From the inaugural meeting, ACHIA’s Steering Committee was formed and has supported and guided ACHIA’s evolution. To view the 2014-2015 ACHIA Annual Report, click here.